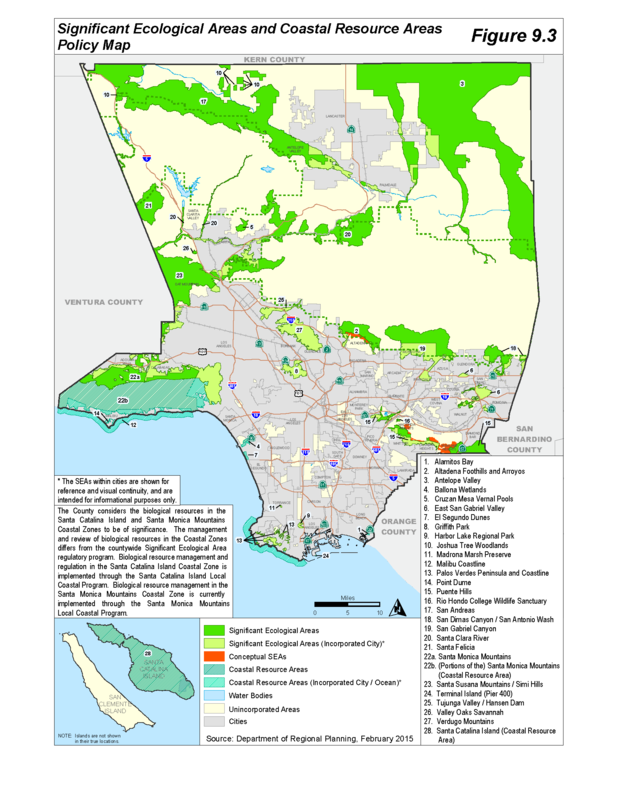 SEAs are officially designated areas within Los Angeles County identified as having irreplaceable biological resources. These areas represent the wide-ranging biodiversity of the County and contain some of the County’s most important biological resources. Each individual SEA was configured to support sustainable populations of its component species, and includes undisturbed to lightly disturbed habitat along with linkages and corridors that promote species movement. The location of the designated SEAs can be found within the General Plan SEA Policy Map (Figure 9.3) or within our GIS Web Application. Use the GIS Web Application to see if your property is located in a SEA. Search by your address or Assessors Parcel Number and turn on the “Significant Ecological Areas (SEA)” layer.